Home / Home Improvement / Built-In Bed and Bunks Vintage Woodworking Plan. Built-In Bed and Bunks Vintage Woodworking Plan. 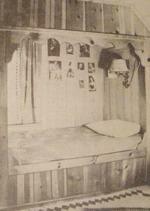 R-ANH0911 - Built-In Bed and Bunks Vintage Woodworking Plan. This is a vintage woodworking plan. Visit our FAQ page for a full definition. The bunk was built into the gable end of an attic. The window provides plenty of air for healthy sleeping, and head and foot may be reversed according to seasons. Your boy or girl would be proud to own it. Bonus pattern included is No. 912 which is the Ships Captain with knotty pine double decker bunks, and real portholes, is just the room to fit up for two modern boys. The bunks are easy to build. Condition of this recycled plan: Very Good (priced as marked), we have a copy of this plan. Plan printed on two sheets of 17 x 22 inch paper and a double sided sheet of 11 x 17 inch paper. Why have a kid sleep in a full-size bed when a kids sized bed will do the trick ever so comfortably and free up much needed bedroom space? These beds are for kids. Arts and Crafts Bunk Beds Woodworking Plan. Kids Oak Bunk Beds Woodworking Plan.